Microdermabrasion or DermaPeel, involves surface abrasion of the skin with fine air-blown sterile particles that cause a superficial peel. 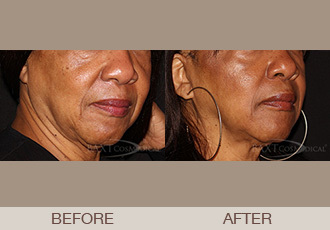 Treatments leave the skin with a completely fresh, revitalized, and smooth appearance. The technique removes the surface skin cells, so there is no “peeling” afterwards, you leave the office with a healthy glow. The treatment is performed by our aestheticians in an easy office visit with no down time. Microdermabrasion is a physical treatment that bombards the surface of the skin with tiny crystals and suction and takes off the top layer of the stratum corneum of the skin. It’s like a light chemical peel without the chemicals. It exfoliates. Mostly everyone can have microdermabrasion and benefit from it. It’s an exfoliating treatment. After Microdermabrasion you can expect slightly pink fresh smoother skin. The results are immediate after treatment. Microdermabrasion gives temporary effects so ongoing treatments are needed to maintain results. There is no downtime. We recommend them monthly in a series of 4-6 to start and them as needed afterwards.